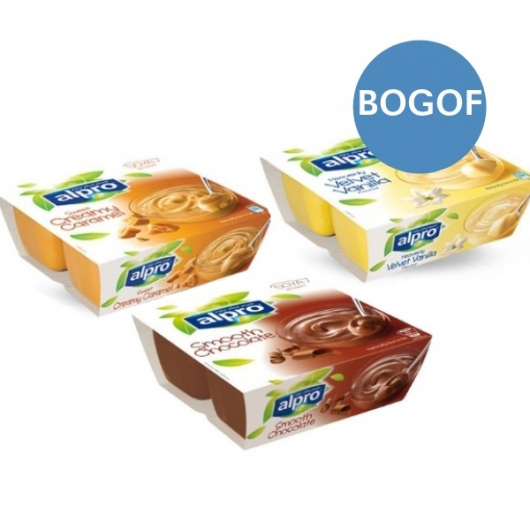 Enjoy plant power in a tasty dessert with these Alpro Soya Desserts - bursting with natural goodness! 100% plant based, these desserts are creamy and naturally low in fat, naturaly lactose free and free from artificial colours and preservatives. Despite their soya base, these are a source of calcium just like dairy desserts and also contain Vitamins, B12 and Vitamin D.
Each one delicious and perfect as a post-meal sweet treat that won't leave you feeling guilty after! Before opening, store in a cool dark place outside the refrigerator. After opening, store all products – including the long lasting products – in the fridge at max 7°C and consume within 5 days.